After reading success stories of people who were able to make money within the comfort of their own home, I figured out that Cyberya Minigosyo would be a good way to start. It would surely provide me the economic support I need without taking much of my motherhood time. With Cyberya Minigosyo, my role as mother can be combined with that of a working woman. Having a job then provided me with steady income to pay off bills and provide for all the needs of my family. While work meant extra money to spend on luxuries and being economically independent, it also has tradeoffs. It meant working on weekends, less time to spend with my little girl and leaving her in the care of a total stranger. I felt guilty on not being at home to look after her. My maternal instinct tells me to quit my job and be hands on mom. After working for over 20 years in the corporate world, I have decided to avail of the retirement program when the opportunity presented itself. With a lot of time at home and less money to budget, I was then dumbfounded with circumstances that have changed overtime. The traditional way of earning money is no longer an option and finding a well-paid work that I can do part-time was really hard. I was at the crossroads. My life circumstances unsettle the foundations of everything I used to believe in. From a working mother who is career-driven and economically independent, I am now a WAHM always on the lookout for freelance writing jobs. I have always written. I have contributed articles as early as in my middle school and well up to the time I retired. They say I have a gift of gab and the internet gave me the opportunity to express it like so. I have a passion for freelance writing and coming up with new articles each time fires up this passion. Aside from writing and blogging, I have also discovered other income opportunities such as selling on online auction sites, doing medical transcription and affiliate marketing. The internet serves as an ever-changing arena for businesses and for a lot of people looking to earn money. Some opportunities lead to part-time endeavors while others can lead to full-time jobs and another internet success story. Hence, the income possibilities of owning a Cyberya Minigosyo is infinite! As a prepaid internet station via PLDT DSL internet connection, this Cyberya Minigosyo can be set up anywhere. Internet connectivity is synonymous with social media presence and so “piso net concept” is a huge hit trending all over the country. Where else will you find an internet-rental service which will allow their customers to surf the internet for as low as one peso? This innovative PLDT product is a good income generation opportunity for a start-up business for small entrepreneurs and housewives like me looking for way to augment family income. It easy to set up and doesn’t require technical knowhow, making it an ideal investment to venture into. 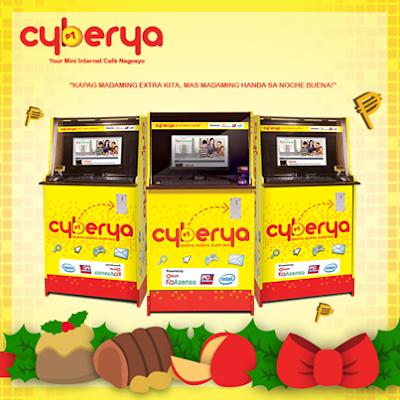 Each Cyberya surfing package is composed of a computer set enclosed in a box equipped with a timer and a coin slot. Units can be strategically placed in a store so that customers who are waiting in line to make a purchase can go online for a few pesos. Furthermore, Cyberya operators can rely on PLDT KaAsenso’s extended 24-month warranty and preferential after-sales support that includes hotline and carry-in repair service that will make Cyberya Minigosyo sustainable for entrepreneurs. Cyberya Minigosyo provides a mini internet café negosyo which would reap high profits and unlimited income without the extra effort! For more information, visit a PLDT Sales & Service Center near you. You may also “like” the PLDT KaAsenso Facebook page, and follow @PLDTKaAsenso on twitter for updates. An internet shop really gives a good monthly income. Cyberya is new to me but I think they are good to try for those who wants to build their own business. Compared to internet shops, Cyberya requires low maintenance. You just need to keep coins handy. Cyberya isn't only beneficial to you but to your neighbors as well. An internet shop with units like this would really make your money growing without you moving. Yes, indeed! With Cyberya nearby, browsing and sending job applications would be possible at any time of the day. Magkano kaya ang punuhan dito to start a business like this one? The new wired broadband version (up to 2Mbps) of the Cyberya package is priced at P 1,300 per month. Initial investment for interested minigosyantes includes payment for the chosen unit (P 18,599 for the surfing unit or P 23,799 for the gaming unit) and initial fees for modem and installation. This is really a good business to operate and also could be a really profitable one. It's easy, affordable and low maintenance. Good luck! We used to have a PC rental business back in the days, it was a good business at the start but it got harder coping up with the fast phased development of technology, plus the investment you have to put into it, however if PLDT says it is, you may try it for a start and see if it will work for you. Happy New Year Millete! Dying to have a Cyberya unit soon. A Prosperous New Year to you as well, Joy. The PLDT KaAsenso Cyberya Package is a coin-operated business with carry-in repair service from PLDT. As such, minigosyantes can run this low-maintenance business with ease. oh! nice read ate millette. I am trying to check my options on how to start a business which will not require a lot from my savings. Will definitely check this out. You can manage this Cyberya Minigosyo in the comforts of your home. It's really a no-brainer task. Sems a good business to invest in. how much ang needed initial fund? The Cyberya machine costs P15,499 under your monthly subscription of P 999 from PLDT. PLDT offers it as a Bundle Promo inclusive of internet connection and complete PC package. best of all, you can avail of the PC package via loan. Whoa. Investment can be at least a peso? Regardless of the business size, we should all study and analyze what we will get into before risking money into it. I got positive feedback from others who tried that cyberya-minigosyo and I am enticed to also venture in that business but I still have to manage my time so I could fit it in my schedules. this is a really great business venture.. it's easy to maintain and no hassles! Internet is one of the in demand business nowadays. Anyone can have it even in the comfort of their own home. I was thinking of that business 12 years ago but I went back overseas and never did it. Internet shop is my last busines but I closed it down December of 2012. Good Luck to your new business venture! Sorry to hear about that. Free WIFI phenomena really did affect internet shops. I heard about Cyberya at one of the WAHM workshops where PLDT was a sponsor. I love that it's low-cost and low maintenance. You're right, it's perfect for us WAHMs! I've seen a sample Cyberya unit at the PLDT office near our place. It really is interesting. If I had the extra funds, I'd want to invest in one. :) Good luck to you! Thanks, Rane. It never occured to me before that I can make a living out of writing. I think this is a good business idea to supplement our income. The location might be a big factor to consider. Cyberya would give you good returns if strategically placed in areas where there is a lot of people traffic---near schools, convenience stores, bus terminals etc. This looks like a great business to put up in my store! But I'll have to gauge the foot traffic first for the next couple of months and see if it's sustainable. :) Thanks for sharing this!